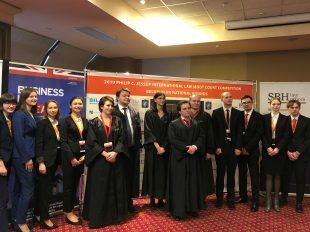 On 25-27 January 2019 student teams from all corners of Belarus took part in the 2019 Belarusian National Rounds of the Philip C. Jessup International Law Moot Court Competition. The competition ‒ founded in 1959 ‒ is the oldest, largest and probably the most prestigious international moot competition in the world. The competition involves simulating a fictional dispute between countries before the International Court of Justice. Every year, more than 2500 students representing over 550 universities and educational institutes from more than 100 states participate in the competition. Traditionally, Sorainen Belarus has supported the Belarusian National Rounds and Alexey Anischenko, partner and head of the Sorainen Dispute Resolution Practice Group, served as a judge on the panel in the final round of the competition.